Our children believe in exploring the different parts of the school which we have carefully designed so that children feel safe at all times. Every day we learn and play through different outdoor games and activities under the close supervision of a professional team. Twelve years ago, we started our journey working in La huerta de Carlos (Carlos’ Orchard), a small urban farm in Pozuelo de Alarcón-Aravaca. The experiences the children had were extremely positive and we wanted to take a step forward and create a nursery (authorized by the Madrid Community). 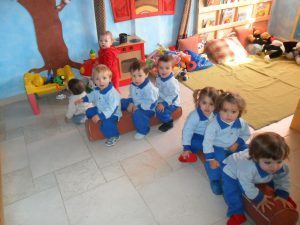 In 2013 we begin a new challenge as an authorized British School, extending the age of educating in our Nursery for students between 0-5 years old. They learn to be independent, to help and respect others, and to develop in their own personal way. Throughout the day, we use English, because we are conscious of the benefits of having a linguistic variety from a young age.